Rugby league's world governing body is looking for a new chairman after Scott Carter's decision to stand down. 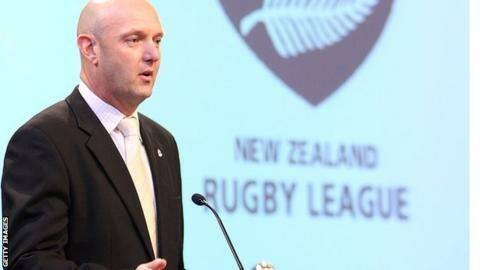 The New Zealander, who replaced Australian Colin Love in 2011, has also given up his role as New Zealand Rugby League's chairman, citing business reasons. The Rugby League International Federation (RLIF) is expected to name Carter's successor in Sydney on 2 May. The 2013 World Cup in England and Wales made a £3.7m profit for the RLIF. "With (chief executive) Phil Holden now settled in nicely and the strategy in place for the next four years, it's a good time to bring in a new chair so that they can get up to speed and make a difference in time for the next World Cup," said Carter. The Rugby Football League's chief executive Nigel Wood, currently deputy chair of the RLIF, recently criticised its failure to finalise a fixture format in the run-up to the next World Cup, which will be co-hosted in Australia and New Zealand in 2017.